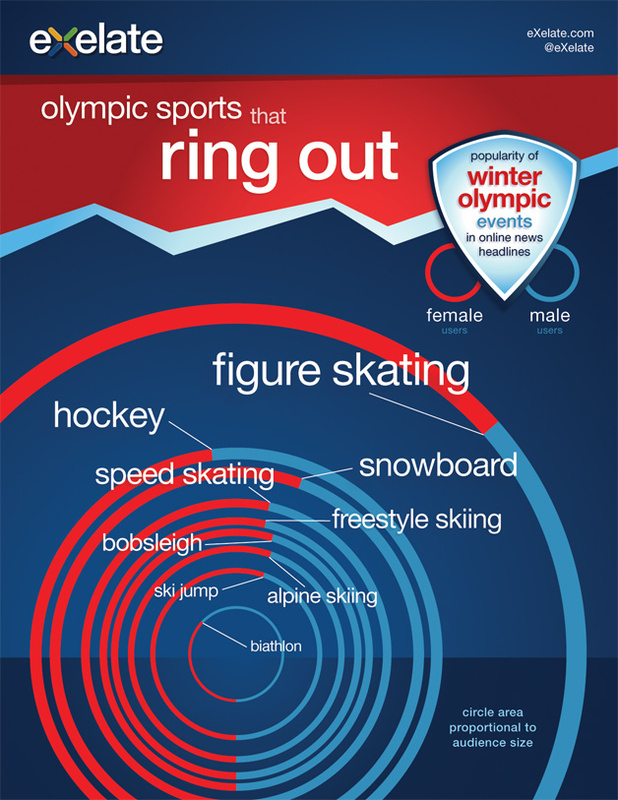 In following infographic from eXelate.com, demonstrate the relative popularity of various 2014 Winter Olympic sports in the news, based on information from internet headlines. The size of each ring in the image below represents the number of people reading online articles containing a specific event in their title, while the proportion of men and women is also indicated with the blue and red segments. The most popular event by far was figure skating, with almost three times as many users as the second most read-about sport, ice hockey. Generally, women tended to be more interested in Olympics news, with figure skating attracting the greatest percentage of female users (63%), while the second most popular sport ice hockey was one of just two events for which the male population of users (52%) outnumbered the female (the other was biathlon with 63% male).